FREEDOM Wireless™ Headset's 300-500 foot range - NO other headset comes close to the noise reduction capability, distance and clarity, of the FREEDOM Wireless™ Headset. 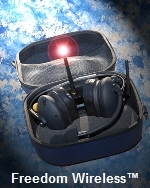 Available in both Behind the Head and Over the Head styles, the versatile FREEDOM Wireless™ Headset is designed for use in multiple applications, including, air boats, railroads, fire/ public safety, military (currently being field tested by the British Army and Navy), racing, agriculture, heavy industry and aviation, particularly ground crew. The interchangeable cable option allows you to plug the transmitter into vehicle intercoms, portable or mobile radios. Simply plug in the module to the rear port of a intercom add 12v power and turn on the headset for full wireless, noise canceling duplex communication. • Battery Life : 24 hours . • Optional 12V DC Car Charger available for “on the road” charging of headset. We use they in our engine room and they are fantastic! Really happy with the quality as we use them everyday. Wow what a fantastic system , clear, easy and complete noise cancelling. Running from 2-6 headsets all at the same time is a dream. They are not cheap but they work PERFECT!